From healthcare to retail to commercial real estate, digital signage has a presence in an array of industries. Would you guess that a hefty 20% of its usage is for digital menu signage in “fast casual” or quick service restaurants (QSR)? Popbar, a franchise of ice cream shops serving up handcrafted gelato, sorbet and frozen yogurt on a stick, is one example of such restaurants. Not just any example, though – Food Network called Popbar a “revolutionary advance in dessert science”. Since opening its first location in New York City’s West Village neighborhood in 2010, Popbar has expanded into six countries including Japan, South Korea and Russia. And the growth won’t stop there – the chain has announced the opening of over 10 new franchised locations by the end of this year. In smart business fashion, Popbar had existing digital menu signage in their shops but were looking for a new, innovative solution. Being a franchise with so many locations at play – eight in North America alone – Popbar’s digital menu content varies by language, time zone, currency, prices, ingredients and more. CrownTV was up for the challenge, taking on multiple Popbar locations in the United States and Canada. Here is how CrownTV’s digital signage software fulfilled each of these needs. Time is money, so like many businesses, Popbar needed a solution with easy setup and no need to train employees or use IT specialists. Fortunately, the CrownTV digital signage player couldn’t be simpler to get up and running. 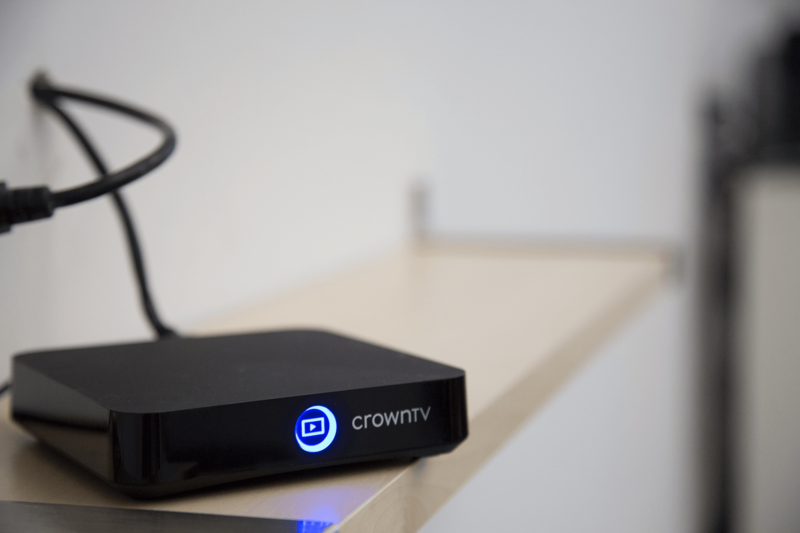 Each CrownTV player comes shipped with the customer’s Wi-Fi information already programmed into it, making it a truly “plug-and-play” device. Any employee can set it up, with no technical knowledge necessary. Popbar was able to simply have each player shipped to the appropriate location and allow that location’s personnel to set it up themselves. “Setup was a breeze. Just two plugs and we were up and running,” Reuben BenJehuda, owner of Popbar, told CrownTV. Some digital signage solutions require professional installation followed by up to 20 hours of training. That’s time and money that many businesses – especially a franchise like Popbar, where multiple installations and training sessions would be needed – cannot easily set aside. 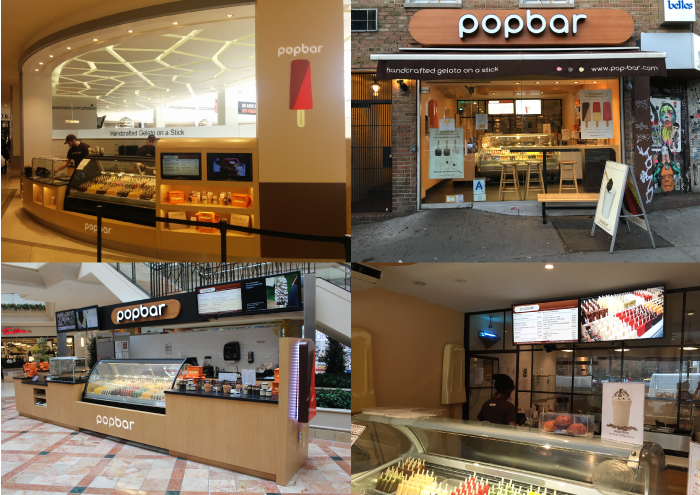 As a growing franchise, Popbar wanted a digital menu signage solution allowing centralized, remote control of any location’s content. “We already had displays but wanted the capability of customizing franchisees’ displays for specific locations,” Reuben said. With its cloud-based dashboard that can be accessed on a web browser, CrownTV’s digital signage software was well cut out for the job. Users can control content from any laptop, tablet or smartphone with an internet connection. In Popbar’s case, a manager sitting in their New York headquarters could control the content on a display in Tokyo or Moscow with just a few clicks. This level of control and customization is ideal for the franchise business model, which requires localization but also a degree of conformity. Popbar’s locations reach from Canada to Florida, meaning centralized, remote content management from one dashboard is key. Popbar says being able to connect remotely is their favorite CrownTV feature, as it allows for targeted marketing. “It’s important because different franchised locations might have different needs at different times – therefore we could target market a location with a specific ad or visual, which is more relevant than a general image,” Reuben told us. 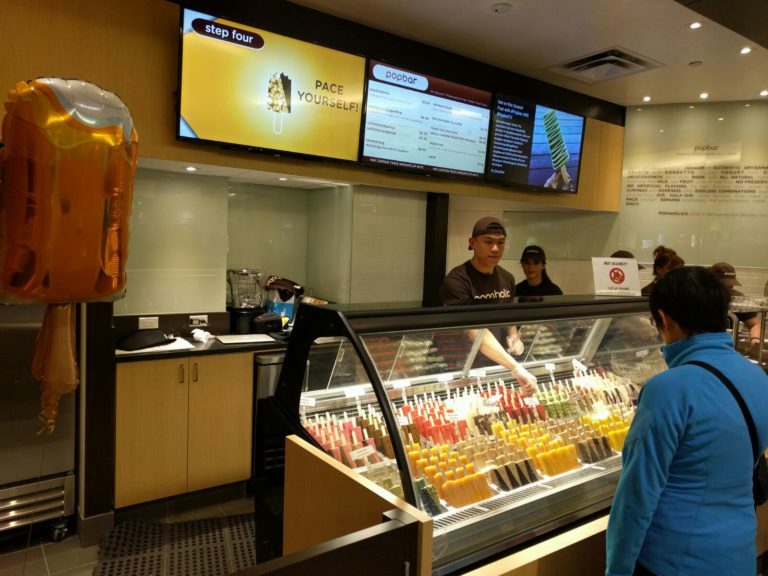 Staying organized is key when your digital menu signage network, like Popbar’s, has several locations, displays and users. CrownTV’s easy-to-use dashboard allows Popbar to group its displays however they like – location being the obvious choice for them – by creating Display Groups. In addition to helping keep their displays organized, this feature lets users apply changes to multiple displays at once instead of one-by-one. Organizing users and giving them control of certain Display Groups is equally as simple by creating User Groups. Even more crucial for Popbar is the Real-Time Player Status tab, where users can check the connection status of all of their displays and see if any are down. This feature, like every other feature in the CrownTV dashboard, works remotely, allowing Popbar to keep tabs on any and all of its displays in real time. “The Real-Time Player has provided to be one of the most useful features offered by CrownTV. We had cases where the internet connection in a particular store went down and the owner did not even know,” Reuben told us. Thankfully with the feature, events like these can be detected right away by anyone with access to the dashboard – and then promptly addressed. As Popbar’s U.S. locations alone cover multiple states and time zones, the ability to schedule content remotely and let it run automatically is of the utmost convenience. Many of CrownTV’s customers like to mix up their scheduling by day of the week or location, but Popbar prefers to keep it simple, having a consistent schedule across all of their screens. The order in which Popbar displays its content is strategic and savvy, starting with general content and then getting more specific. They begin with content that introduces customers to Popbar’s product, highlighting its all-natural ingredients, customizability and gluten-free options. Popbar then showcases its specific offerings, like shakes, sorbetto and frozen hot chocolate, as well as how the ordering process works. Popbar likes to schedule its content in a way that properly acclimates customers to its products, offerings and ordering process. In the future, Popbar hopes to schedule in content promoting new products in specific locations. But for the time being, simple, consistent scheduling is what works for them, especially being a franchise with homogeneous product offerings across locations. User-generated content / Branded hashtags – Popbar encourages its customers to share photos of them and their Popbar treats using the branded hashtags #Popbar and #PopbarTV. Popbar can then easily search Instagram for all photos using these hashtags and share them on their account. Customers love seeing their photos show up on the display, and Popbar receives valuable exposure on social media. It’s a win-win. Real-time promotions – Customers who pay attention to Popbar’s Instagram feed are sure to never miss a sale. That’s because Popbar often shares graphics promoting limited-time specials like buy one get one free or online discounts. These graphics have maximum impact when displayed in Popbar’s locations, alerting customers of an opportunity on the spot. Only at our #West Village #NYC location: Buy 1 #popBun Get 1 FREE! All weekend long! Popbar does Instagram digital signage right, tapping into the large “foodie” presence on the platform and taking advantage of the visual nature of its product. “We offer a very visual product – we like to say that our customers eat with their eyes – and no two Popbars look alike. Therefore, we utilize social media extensively as a means to share the Popbar experience with the outside world. Customers love it, as they get to post their gelato creations online for the world to see,” Reuben said. All digital signage users should take note of these strategies for social media integration. For more tips on leveraging Instagram using digital signage, see our blog on 7 Best Practices for Displaying Instagram with Digital Signage. Drool-worthy dessert creations deserve vibrant, attractive digital signs to show them off, and Popbar found the perfect way to do so with CrownTV’s digital menu signage solution. Stop by one of their many locations to see for yourself! Want CrownTV to do for your restaurant what we did for Popbar? Request a demo of our solution to get started.